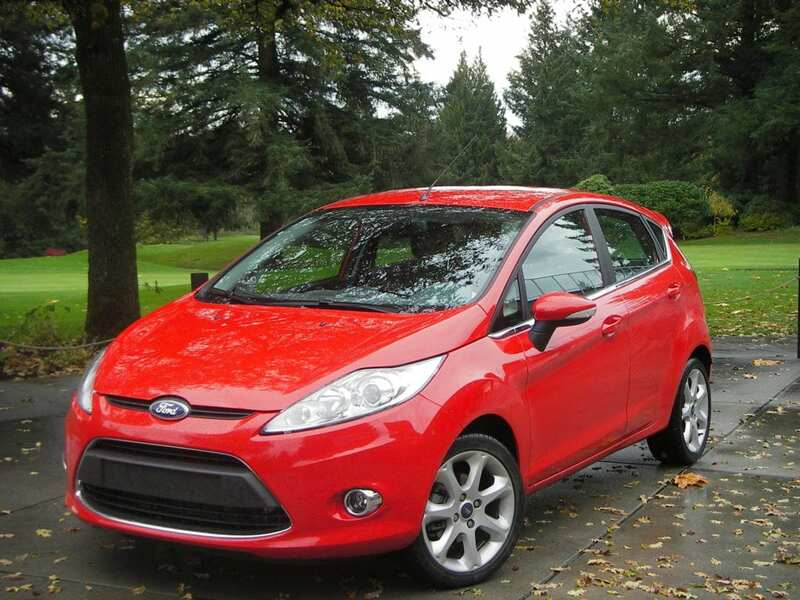 The reborn 2011 Ford Fiesta is available as a four-door hatchback or sedan. It’s powered by a 1.6-litre four-cylinder developing 120 horsepower. Transmission choices are five-speed manual or six-speed automatic. Introduced in 1976 and built in Germany, the original Ford Fiesta was one of the company’s most successful models. Over the years, Ford sold some 12 million of the sub-compacts worldwide. It was discontinued in North America in the early 1980s, despite continuing to be offered elsewhere. In Europe, the Fiesta has consistently been one of the company’s best-selling vehicles, available with gasoline and diesel powerplants. Why did Ford take it off the market over here? A big part of the reason seemed to be the intransigence of American buyers. Even now, they apparently have a hard time getting their heads around the concept of driving small cars. Many U.S. consumers have a mulish unwillingness to get behind the wheel of sub-compact cars (and small displacement diesels) and, like it or not, our neighbours to the south are still the big dogs in North America. If it’s big cars and SUVs they want, it’s big cars and SUVs they get. Ford, like all carmakers, simply responded to the market. Anyway, Ford introduced a new, sixth-generation Fiesta at the Los Angeles Auto Show in December 2009. It hit the Canadian market in early 2010, as a 2011 model. It also garnered a win at the 2011 Automotive Journalists Association of Canada Test Fest, in the Small Car Under $21,000 category. The closest runner-up here was the Mazda2, which, in many ways, is essentially the same vehicle. Built on the same platform as the Mazda2 and manufactured in Mexico, the reborn Fiesta was available as a four-door hatchback or sedan (although they looked remarkably similar) and was powered by a 1.6-litre four-cylinder developing 120 horsepower. Transmission choices were a five-speed manual or six-speed automatic. Performance was lively, and the new Fiesta boasted more grunt and revving power than one of its fiercest rivals, the Toyota Yaris. With European-designed suspension, it also had better handling and braking than many of its Japanese competitors. Interior cargo volume, key to this market, was around 980 litres with the back seat folded down, and the Fiesta accommodated four passengers in relative comfort. There’s one safety recall from Transport Canada to report. Apparently, on some models, the passenger side airbag will not deploy due to a glitchy “restraint control module.” This recall applies to all years of the new Fiesta, from 2011 right up to 2013, but fixing it is merely a matter of reprogramming the module and is easily done at a dealers. The U.S. National Highway Traffic Safety Administration, meanwhile, has at least 16 technical service bulletins out for the 2011 Fiesta. These include issues with power door locks, problematic software for the airbags, wonky brakes, starting problems and, my favourite, “the manual windows may drop while driving.” Hello. Not a lot of love from Consumer Reports for this one. According to this organization, new model reliability for the first year of the Fiesta was some 38 per cent below average and, overall, it received a “worse than average” grade. While the Fiesta’s fuel economy is praised, CR has issues with the lack of interior room and various electronics. A major problem area seems to be the transmission, and things like paint and trim and the audio system can be troublesome. One suspects that Ford’s irksome Sync system may be responsible for this last complaint. Marketing researcher J.D. Power, on the other hand, likes this one … sort of. It gave the new Fiesta its highest marks for overall performance and design, comfort, style and interior features. It was also a recipient of this organization’s Performance Award. That said, it fell a bit short in the J.D. Power Initial Quality Survey, with mediocre grades for overall quality. This measures buyer satisfaction in the first few months of ownership. Overall, it gets an “about average” rating for predicted reliability. Expect to pay anywhere from around $3,500 for a high-mileage base model, right up to the mid-$8000 neighbourhood for a top-of-the-line, low-mileage SES version. Alternatives: Toyota Yaris, Mazda2, Honda Fit, Kia Rio, Hyundai Accent, Nissan Versa, Chev Aveo, Suzuki SX4.